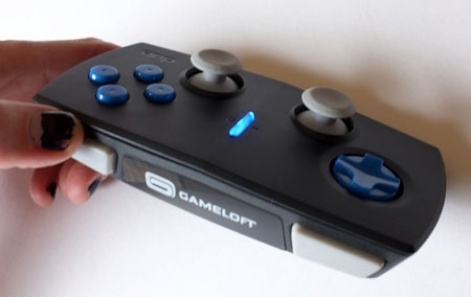 US peripheral company Discovery Bay (via its Duo Games label) has hooked up with Gameloft to release its Duo Gamer iOS controller. The $80 Bluetooth gamepad - out 5 October - will only support Gameloft titles, with the likes of Asphalt 7, Modern Combat 3, Order & Chaos Online, Brothers in Arms 2 and N.O.V.A. 3 currently optimised. In terms of iOS hardware, the Duo Gamer works with iPad, iPhone and iPod touch; shipping with a handy stand so you can position your device in a more console-like manner. Of course, you can also use it with your TV using HDMI or Apple's AirPlay streaming tech if you want the real console experience. "We've worked closely with Gameloft to ensure that Duo Gamer is optimised to the fullest extent for their rich, immersive game apps," said Mike Sievert, CEO of Duo Games. "By providing gamers with the first and only console-style gamepad controller for iOS, we are giving them the ability to enjoy a 'kick back' experience while still harnessing the power and graphics capabilities that iPad, iPhone, and iPod touch offer. This will be a game-changer." Because it only works with Gameloft titles, the Duo Gamer has been officially sanctioned by Apple, and will available on Apple.com, as well as via other retailers. I'm not part of it btw, just a backer! Great bunch of guys, experience in the market and the product itself looks brilliant! AND it'll work with any bluetooth gaming phone/device!